But this isn’t science fiction. These are solitary wasps. In Arizona’s Sonoran Desert, the Tarantula Hawk, a huge wasp, buzzes low, looking for a tarantula burrow. It dives in – and out comes the tarantula, closely followed by the wasp. In a titanic struggle, the wasp flips the 4 inch spider over and stings its nerve centre – then hauls the paralysed spider back down its own burrow and lays an egg on it. 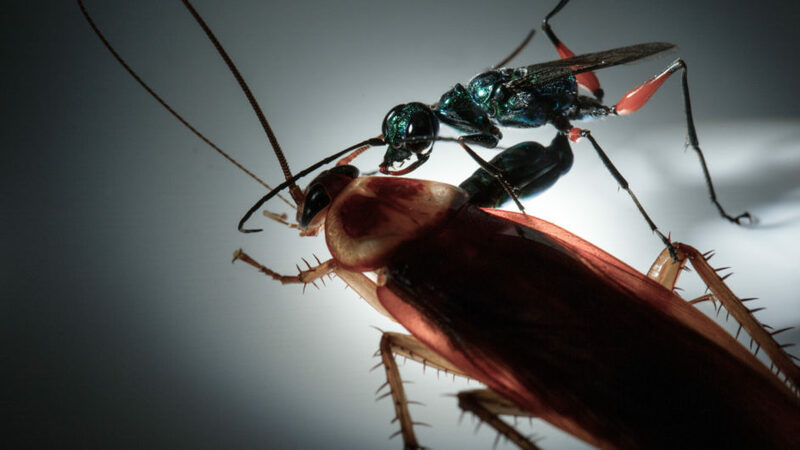 In the rainforests of Asia, a jewelled wasp hunts a cockroach, much bigger than she is. Her venom doesn’t paralyse the roach, but turns it into a zombie. Trimming the roach’s long antennae, she uses them like reins, leading the roach to its doom. The Bee Wolf wasp hunts honey bees, pouncing as they feed on flowers or catching them in high-speed aerial chases. The immobilised bee still has its clinging reflex, so hangs onto the wasp as it’s carried to the wasp’s burrow. We’ll meet scientists asking how do these wasps navigate back to their nests, and how do they find their victims? Despite such a small brain, wasps seem unnervingly smart. Scientists train a close relative of solitary wasps, Polistes, to visit at the same time every day for a free handout of caterpillars. Other wasps team up with plants, when caterpillars try to eat their leaves. When attacked, some plants release chemicals that call certain solitary wasps to help – by taking the caterpillars. Some wasps build elaborate mud pots as nests, yet sand wasps just dig a simple burrow. When they leave to hunt they plug the burrow with a carefully chosen stone. Other sand wasps resort to theft – waiting until another wasp leaves, then unplugging the burrow and stealing the already paralysed caterpillars. Stylistically, the film will have the flavour of classic ‘B’ horror movies like ‘Them’ or more recent ‘hokey horrors’ like ‘Eight-legged Freaks’. And with specialist lenses, we’ll be able to enter fully into the strange world of solitary wasps.